This is a gorgeous little game from Orisinal called A Daily Cup of Tea. 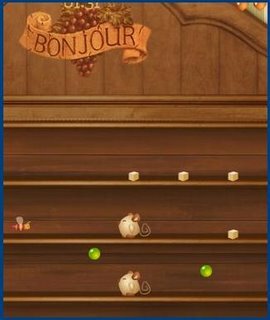 You control two mice whose mission for the day is to climb up the bookcase collecting sugarlumps for their tea. Each day becomes slightly more harrowing as you encounter falling books, bouncing balls, wasps and various hazards. The trick is to have one mouse on one level, knocking the cubes down to the other mouse. For those of you with dodgy pasts, just think of shoplifting with your mates and you'll be away. Control is using the mouse :) so you can clutch a cup of coffee at the same time. Perfect. Oh wicked, I forgot about Orisinal. I can get to the end most times but I haven't yet managed to get onto the leaderboard. Bloody impossible to play with one of them touch pad thingys on laptops. * Most of this is lies.